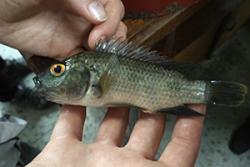 A sample of the oreochromis species. : Credit: Tarang Mehta, Earlham Institute Tilapia are a group of tropical freshwater fish from Africa that support a rapidly growing multi-billion dollar fish farming industry. However, this important food source is at risk as native species are interbreeding with farmed varieties. This is affecting both among wild and farmed fish, and has been a growing cause for concern. Although the industry is thriving in Asia, fish farming is still in its infancy in Africa, where most tilapia are harvested from wild populations by traditional fishing methods. The seven-year research programme mapped the distribution of native and non-native tilapia species and used state of the art molecular genetic methods to uncover cross-breeding in fish farms and among wild communities, both of which represent a threat to the natural population and to food security. Oreochromis species of tilapia. : Credit: Tarang Mehta, Earlham Institute The next phase of the project, funded by the JRS Biodiversity Foundation will expand the programme to Kenya, with the aid of a smartphone app for recording distributions, and help to identify pure populations. These can be used to restock fish farms, to help sustain food production both from wild and fish-farm stocks and to maintain the wild genetic diversity that can help insure the global industry against threats such as new disease outbreaks. “In a country facing rapid population growth, a reduction in fish production as a food source poses a serious threat to the sustainable aquaculture development needed to keep pace with population growth. Use only large-bodied native species in wild fisheries to eliminate risk of hybridisation and disease. Distribute only hatchery-validated juvenile fish to avoid contamination with small-bodied invasives. 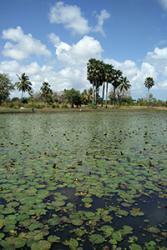 Promote zoned aquaculture for smallholders, based on species indigenous to the catchment. Restrict use of non-native strains to large commercial farms, which have strong biosecurity. • Promote fish identification skills among fisheries, aquaculture and conservation practitioners. 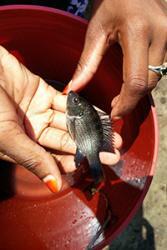 • Identify and protect ark populations of each indigenous tilapia in Tanzania, to conserve genetic diversity.